95 percent of writing is thinking. Eliminate marshmallow words; “there is”; very. Switch from honey boo boo writing to World Cup writing. Beware of the curse of knowledge; eliminate assumptions of what people may know about your story. If it sounds wrong and it looks wrong, it probably is – change it. Don’t be a creepy date; if something isn’t working, let it go. Verbs are your BFFs; informs readers about your characters. “Things” belong in horror movies. Love your grandmother; you can’t love anything else. Punctuation is not about feelings; understand where they belong; you’re allowed one exclamation point in your life. It’s a quest to bring responsible journalism to live-tweeting. It’s a good quest, a quest to change the work ethos of journalists when it comes to tweeting during breaking news events. I’ve written and spoken about this topic at a number of different conferences and I’ve adopted a new tactic in my quest: Calling out poorly reported information passed along by journalists during a breaking news event. My quest has lead me to a few Twitter discussions with journalists during breaking news events. Some have not received my questions well. In the rush to be first, journalists and their news organizations continue to publish false information. Joe Paterno, Gabby Giffords, Sandy Hook, Boston Marathon Bombings, Navy Yard shooting, LAX shooting, New Jersey mall shooting. The list of news events where “spaghetti-against-the-wall journalism” occurs just keeps growing. It’s a vicious circle. Amateur journalists feed social media, social media feeds broadcast outlets, who feed Twitter….round and round we go. But there’s hope. Some of my former students who were working and covering the Boston Marathon bombings story were tweeting out questions about why speculation and rumor was being tweeted out by amateur and professional journalists. And, in the end, they were acting a lot more responsibly as they reported during a crisis situation. Why were rookie reporters acting more responsibly than seasoned veterans? Student news organizations have traditionally existed to give students experience before entering the workforce. The kinds of journalism jobs and journalism companies have changed considerably in the past 10 years, and most student news organizations are set up to mimic traditional print or broadcast news outlets. How would you set up a student news organization in 2013 or how could an existing college news organization modernize itself? Ideally experience at a college media organization would help a student learn relevant skills for the workforce and help students land a job. If you work at a news organization, what kinds of skills do you and your organization look for in new hires? What kind of “clips” should college students have by graduation? You can approach this as your advice to college media organizations or as if you were a theoretical adviser or manager of a student news organization. Or as a theoretical employer imagining the ideal experience a just-graduated student should have gotten. I try to follow most of my students after they graduate, seeing where they land in the profession and watching their progress over time. Some of them have had experience working at a student-run publication, some of them have had internships and some of them have taken my Investigative Journalism class. That class partners up with a news organization each semester — and is where they get their stories published. In the past we’ve partnered with The Boston Globe and MassLive and we’re currently partnering with The Huffington Post. There’s a lot being written these days about the future of Journalism Education. Ideas range from teaching students code, data visualization, computer programming — they all jockey for the trending subjects of the day. Which is all fine. I support all of that. I refuse to buy that. I’m not going to throw up my hands and surrender to inaccuracies being the norm. What I like about this current generation of students/alums, is that they really seem to get it. They understand technology. They’ve grown up with it. They understand the amplification effect provided by social media. * I left before the awards dinner and in general I try not to get caught up in awards-mania but I will say that honoring Boston.com and BostonGlobe.com’s coverage of The Boston Marathon Bombings was a sign that good journalism matters and still gets recognized. The Boston Globe’s web sites — which won for Breaking News — provided authoritative, credible information via its live blog. The professionalism of those working on the sites provided them with the strength to shy away from the hysteria and rumor which swept through much of the Twittersphere on that horrible day. Kudos. * And, the indefatigable Michelle Johnson and her crew from the Boston University New Service also received well-deserved recognition for their efforts. Student journalists can perform at stunning levels when inspired by the right professor. Michelle is one of the special ones. * Listening to Boston.com’s Teresa Hanafin talk about the days of the bombing at the breaking news panel — and watching the gripping video again — was one of the more emotionally powerful moments of the conference. * I forgot how much Lisa Williams makes learning new technology fun. * Lisa’s sessions — and all the hands-on technology sessions — were standing-room only. Probably the most popular sessions of the conference. * Those sessions were part of the different feel to the conference. Josh Hatch described it as “NICAR-ish.” Definitely true, but there was something else. Part of it was the strong presence of first-timers (657) and a much younger crowd. The University of Georgia was No. 2 on the list of top-five organizations represented at the conference. And, academics — both students and professors — made up almost 200 of those represented at the conference. * Got to hang with my academic friends and also did a little brainstorming with fellow professors at the “Hack the Curriculum” session. I hope this is the start of something larger — would love to see ONA sponsor some efforts for academics and professors to get together and develop specific guidelines for curriculum at journalism schools. * The “Circle of Life” was a phrase heard from a few professors. While I had one student (Brittney Figueira) doing great things in the student newsroom, the “Circle of Life” comes when you see former students (Eric Athas) and former interns (Patrick Cooper) becoming conference regulars. * Amy Webb’s “Top 10 Tech Trends” session was well-attended and talked about by many. I couldn’t make it this year but the strong Twitter presence at the conference allowed me to catch up via Twitter. There were 30,000 conference tweets. Wow. * Got to hang out with the Digital First Media crew for a bit Thursday night. Great to see a dynamic, young group excited about the future of journalism. * I missed last year’s conference so I don’t know if this is a trend but the Thursday-Friday night receptions have had some amazingly good food in past years. That was missing this year. Bring back the rocking chefs! * I did like the band, though. Any time horns are on stage it’s a good time. * Because Mark Briggs can’t sit for very long, he’s developed a food app dubbed FORK. Check it out. * The ONA conference is reunion central — I couldn’t walk very far without bumping into an alum from The Washington Post or the University of Maryland. The talent at The Post’s web site in the early 2000s was stunning. That talent is now scattered all over the country at different places and it’s great to see everyone’s successes. And, keep a close eye on what the gang at Maryland are doing — some strong innovation is coming from Terp-land. * Loved seeing (and taking part in) the ONA Ethics session. I’ve been pushing for something similar for a few years now, leading Lisa Williams to tell me she dubbed it the “Steve Fox session.” Huzzah! * And I finally attended the legendary Greg Linch Karaoke Night…..legendary indeed. The Real Question for Jeff Bezos: Time to Invest in Journalism? It’s been fascinating to watch the cheerleading that’s gone on since the announcement that the Graham family was selling The Washington Post to Amazon.com founder Jeff Bezos. When the announcement was made, the reaction from technologists and Web journalists was pretty reflexive. Many out there are describing Bezos as a savior, as the person who will finally help The Post get its digital act together. Lots of cheerleading about the possibilities with new packaging, and the “bold” business acumen of Bezos. We’ve seen letters to Bezos from former Posties and declarations of hope from former Posties who worked for Bezos. We’ve seen a little finger-wagging from current Posties as well as a long parade of sentimentalism praising Don Graham, and reminiscing of a time gone by. It seems we’ve seen both ends of the spectrum — cheerleading from technologists and other journalists who seem almost giddy that a rich tech guru will become a major media player — and those lamenting the end of an era. It’s been hard to find. As another former employee of the Post Company (I worked at washingtonpost.com from 1996-2006) I’m also curious as to how this new transition will work out but I’ve hesitated to jump on the Bezos bandwagon. Yet, it’s been difficult to hear any real analysis amongst the cacophony of cheerleaders saying Bezos will create a Post where the readers will finally get what they want (like with Amazon.) What exactly does that mean? More coverage of the Royals? More video of car chases? More shallow news of the weird? There’s been plenty of commentary about what a technologist like Bezos can bring to a company like The Washington Post. And, yes, after stagnating for the past 15 years, The Post will finally have to change its business model and those not on board with a “digital-first” mindset will not last long. But, what about the journalism? Yes, The Post was a great newspaper but just because the delivery mode is changing doesn’t mean the journalism should. The real questions for Bezos have not been asked — or answered. Will he invest in a timely, costly investigative pieces? Will he devote time and resources to foreign reporting? Will he re-open bureaus that have been closed in the past decade as cost-cutting measures? Some have described Bezos as a bottom-line kind of guy, well the bottom-line is that good investigative journalism takes time and money. And, Bezos won’t see much return on his investment, unless you can start quantifying “afflicting the comfortable” and holding government accountable. Since the onset of Web journalism, there has been a wrestling match over the role of journalists and editors. The gatekeeping role has disappeared — no longer do journalists and editors determine what the user/consumer should read. The Great Decoupling, as JD Lasica put it. That unwillingness to give up the gatekeeping role and create new roles hurt The Post and many other news organizations. But, it’s beginning to feel like the pendulum needs to swing back a little. We live in a scary, secretive time where the idea of privacy is laughable and where the public, press, and judiciary all seem to support the right of the government to eavesdrop and collect information on the citizenry at will. Jay Rosen recently asked how we can get ourselves back to an informed citizenry. Jeff Bezos can go a long way to doing that by investing in journalism. I think many are hoping he will. We’ll see. This photo, taken about two miles from the finish line Monday, was taken hours before the bombings. Photo by Melissa Turtinen. 1. Where were you when the bombings occurred? I had taken the day off of work. Marathon Monday is one of my favorite days of the year. I had spent the morning watching the runners. 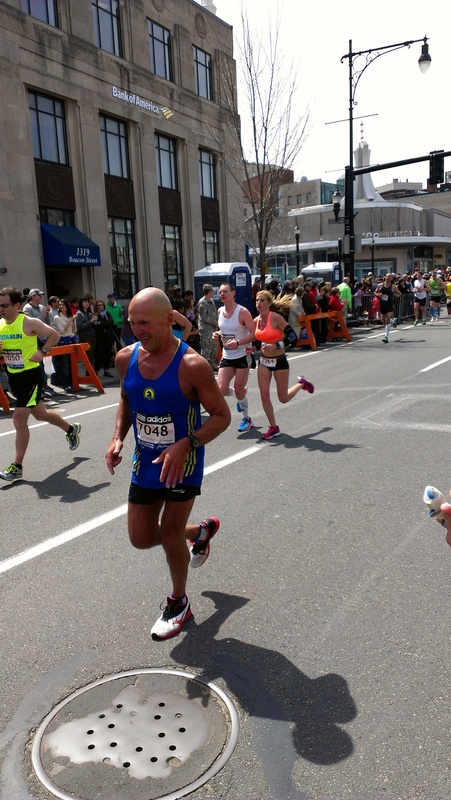 When the bombings happened, I was sitting at a Brookline restaurant about two miles away from the finish line. I was about to order when I got a text from my co-worker asking if I was at the finish line. I assumed she wanted photos for our slideshow. I was wrong. She was making sure I was alive. 2. What were your first reactions? Were you working? I assumed it was an electrical explosion. It didn’t even occur to me it could be something worse. When I asked my co-worker if she needed help. Her response was “I don’t know, I think so.” I got up from the table and got on the T. As text messages poured in it started to hit me. People were dying. The T stopped its service just down the road and I got off the T and ran, walked, jogged the three miles to work. During that time I had awhile to think, look at my surroundings, and take in what was happening. I was walking on a street that runs parallel to Boylston Street, where the bombing happened. I could smell it. Some people around me were also crying, others looked frantic and some people didn’t seem to know anything had happened. When I got to work I put my emotions to the side. I pretended it wasn’t really happening. It’s the only way I could have gotten through the day. I blogged about it last night when I got home… it’s a more detailed account of my reaction. 3. How have you viewed the coverage? Have you used social media? Being one of the managers of 7News’ social media accounts, it was one of the main ways we provided information to our viewers. Our coverage started with trying to provide the most accurate and pertinent information first — links to Google people finder, information for how people could contact their loved ones, while we tried to confirm what happened so we could get the word out. A lot of our coverage started with video of the scene, because we had cameras at the finish line, including first-hand accounts from our reporters who cover — or run — the marathon every year. It was definitely difficult to determine what photos and video were okay to post on our website. How do you determine what is too graphic while trying to convey what happened to those who weren’t there? It’s a thin line. What’s okay? I don’t think I’ll ever know the right answer to that question. Even the day after I was still struggling with what was acceptable to show viewers. 4. What are your thoughts today? Today was harder. It became a reality. It was harder to keep my emotions in check, but I knew I had to. Every new story of a victim, of someone reaching out to help someone, affected me. On the bus into work I found myself tearing up while scrolling through Twitter. When I walked to work there were numerous armed officials stationed a couple meters apart holding huge guns. I’ve never seen a gun that big in real life. I was nervous, sad, and finally starting to comprehend what was happening. There were highs and lows throughout the day as victims were identified and officials released more information on their investigations. I was stressed at points because we were so busy in the newsroom. I was sad, angry, frustrated, exhausted and most of all emotional, but I think I was able to hold it together well enough to get my job done. We stayed on the air from 4:30 a.m. to 6:30 p.m. When we do this during snowstorms viewers send angry emails, tweets and Facebook posts. Today we didn’t get that, even when there was a lull in new information. It showed how affected this city, the state, the nation, was by what happened on Monday. 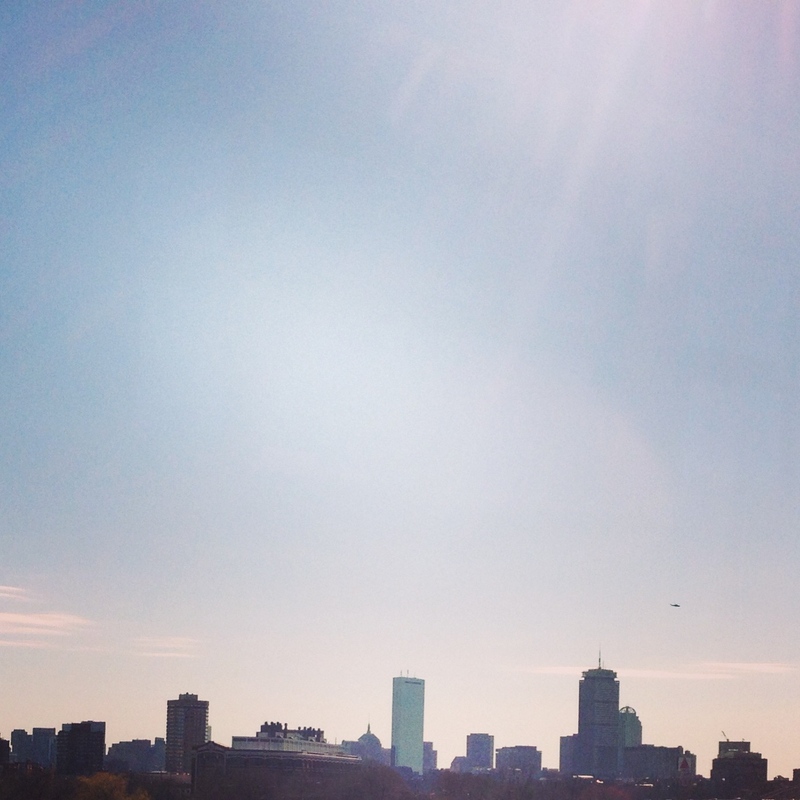 Boston on the day after the Boston Marathon bombings. Photo by Eric Athas. I was working in our offices, which are more than a mile away from the site of the bombings. I stepped out to get a coffee when my sister, who also works in Boston, sent me this text message: “What happened at the marathon do you know?” I opened Twitter on my phone and immediately realized how bad things were. I left the cafe and headed back to the office. On my way I passed by a firefighter who was already gearing up. He yelled to another firefighter, “There was a terrorist attack, let’s go!” Everything became real at that moment. My first reaction was, Who do I know who might be at the marathon and are they okay? Fortunately, friends and family are safe. Later in the day I went to WBUR and helped with their social media coverage. If you haven’t visited WBUR.org, you should. They are doing an outstanding job covering this story, both on-air and online. When I returned to the office after first hearing the news, I watched television news while scanning Twitter. I already follow a strong set of local sources who I’m familiar with so I had a reliable stream of information to watch. Of course there are so many questions right now about how this happened and who’s responsible. But I think the victims and their families are in everyone’s thoughts today. Hannah McGoldrick graduated from the UMass Journalism program last May and quickly landed her dream job as an associate multimedia editor for Runner’s World. When the bombs went off at the finish line of the Boston Marathon, she was inside the press room at the Fairmont Copley Plaza Hotel. 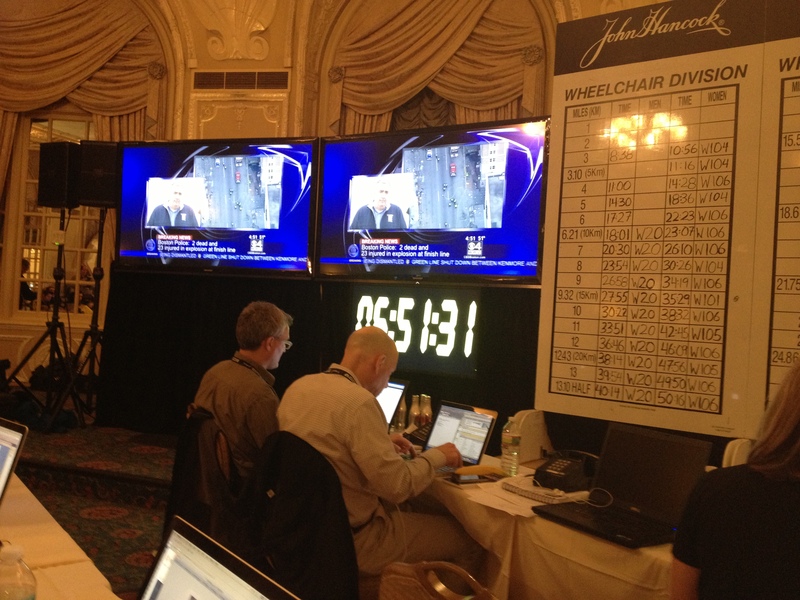 I was in the press room at the Fairmont Copley Plaza Hotel when the bombings occurred. I had just finished my race recap of the U.S. Elite Women runners, including Massachusetts native, Shalane Flanagan, and filed it to my editor. I was there with two other editors and our web producer, as well as an editor from The Running Times. The press room is where the majority of the media watches the marathon on race day and elites are shuffled into the press conference room right after finishing, so once the building went into lockdown, the majority of the press on the scene was not allowed to leave. We knew about as much information as those who were watching TV from home. I was talking with my coworkers when we heard the two bombs go off. At first we thought maybe it was thunder and continued with our conversation. But, when one of the B.A.A. press reps came running into the room to declare the lockdown we knew it was serious and shortly after we found out it was a bomb near the finish line. My first reaction was, is all of our staff safe? We had four staff members running the marathon and we knew two of them hadn’t finished yet and one of them had just crossed the finish line. A Boston Globe reporter was sitting near me most of the day but he had been out at the finish when the explosions went off. He came running back in with his videocamera and was visibly upset, saying he had seen limbs and blood everywhere. We didn’t really know what to do. We tried to collect as much information as possible to get up on our website because we knew people would be coming to Runner’s World for answers. WBZ was playing in the press room throughout the entire day and when the bombs went off that was our source for information, besides the press people from the B.A.A. We had one editor who was on the photo bridge at the finish when the bombs went off so we were able to get a first-hand account from him. We were cautious about what we put out on our personal and official social media accounts. My editor first made sure we contacted our loved ones so they would know we were OK. It was hard to get information out and to get information in in terms of coverage, but we tried to get the most accurate, and officially confirmed information on our website. We did not need to make any corrections or redactions. Today has been tough. I’m still trying to process everything that happened but I also have a job to do. As a journalist, my job right now is to stay calm and report as many facts as I can confirm. I’m working mostly on the local angle, what local running clubs are doing to help, how people can show support, as well as providing back up and ledes for our news editor. But as a Bostonian and a runner, I feel as though my family has been attacked. I can attest that both the Boston community and the running communities are full of strong, resilient people and we will get through this, but it’s not going to be easy. I am grateful no one from my team was hurt as a result of this tragedy but my heart just breaks for those who were.